Each day as I wake and look out at the sky and see its bright blueness and its clarity I wonder from whence cometh the rain. While parts of the country are still water-logged after heavy downpours and floods, here we cherish each drop, recycle the grey water onto the garden, bathe in less than a small bucket, and think about and pray for rain. Sometimes there are sights of grey skies, perhaps a hint of being overcast, but nothing or very little of the watery drop transpires. 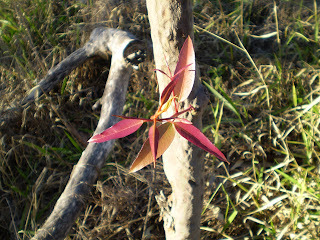 The image of this tiny new branch with its luscious crimson and copper leaves emerged from the small eucalypt after the last rainfall a couple of weeks ago. It flushed the river and brought life-giving oxygen to the water. The river needs another bath. Worshiping water, the water that flows in the river, through the ocean, in our bodies, through the blood, sweat, tears, urine and amniotic fluid, connects us to the lifeblood of the planet, to the element of 'Divine Water' (Arvigo & Epstein, 2003), to the gushing salty liquid that rises and falls on the tides of the river. Rosita Arvigo and Nadine Epstein have written a generous homage to the Divine Water through their book called Spiritual Bathing: Healing Rituals and Traditions from Around the World (2003). Water is worshipped by many cultures still, and through the book gods and goddesses swim through mythologies, creation stories, religious histories, and is woven through rituals that revere the liquid bliss. In the book they explore the spiritual significance of water rituals through ancient and modern religious practices, from Egyptian to Mayan, from Judaism to Islam, from Scandinavia to Africa. Cleansing rituals, rituals of purification, for protection or prosperity; water-based practices for scrying, healing and contemplation. The spirit of water bubbles through the beautiful images, with the authors commenting: 'A spiritual bath usually combines water, prayer and ritual - and sometimes includes plants - to wash away the negative effects of ....[and here they list a stream of emotions such as 'anger, fear, grief and trauma, and a broken heart'](2003:3). The earth, like the human, needs a spiritual bath, and the ground needs to be watered with 'aspersions' (meaning 'To scatter and sprinkle with water', 2003:2). If you would like to make a comment, please click on 'Comments' below. Arvigo R & Epstein N, 2003, Spiritual Bathing: Healing Rituals and Traditions from Around the World, Berkeley & Toronto, Celestial Arts.